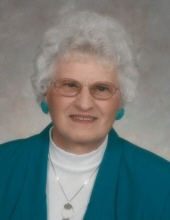 Marjorie A. Wilcott of Marshfield passed away peacefully on Monday, April 1, 2019 at Three Oaks Health Services, Marshfield, after a long battle with Alzheimer’s. Marge was born August 8, 1930 at home in Stratford WI to Joseph and Margaret (Baltus) Kaser. She grew up on the family farm along with her six sisters and six brothers. She attended Saint Joseph Parochial School and Stratford High School. She left her family home at an early age to begin her employment at Saint Joseph Hospital in Marshfield as a nurse’s aide in the infant nursery. She then moved to Racine WI to be with family and was employed in manufacturing. She met her husband Donald Wilcott and was united in marriage on May 14, 1949 at Saint Rose Church in Racine WI. Marge and Don both worked in Racine while starting a family before returning to the Marshfield area. They purchased a tavern in Auburndale in 1955 from Don’s father. Marge raised a family of 5 children while operating the tavern business as her husband held a fulltime job. As her family grew older, Marge returned to school to finish her high school academic skills and obtained her General Education Diploma. She worked for the United States Post Office in Auburndale, Wisconsin Rapids, Stevens Point, and Marshfield. With the tavern business sold and her career with the Post Office complete, Marge entered full time retirement. She enjoyed traveling with friends and the simple pleasures of life, the little things that made life beautiful; such as spending time with her children and grandchildren enjoying the creative learning of a child playing with a large empty cardboard box verses an expensive new toy. The satisfaction of taking a walk and along the way picking up litter to make the path more beautiful for someone else to enjoy supported her belief to always leave a place better than when you found it. Marge had a kind heart and caring interest which allowed her to converse with everyone she met young and old. Her faith and lifestyle allowed her to be happier and more fully engaged in life by devoting her time, energy, and financial means to help those in need. As her children, we received many lifelong values and faith examples from our mother which we all are so very thankful. Mom, may you rest in the peace and the everlasting love of your Heavenly Father. She is preceded in death by her parents, Joseph and Margaret (Baltus) Kaser, brothers; Eugene, Leonard and (Mary), Harold and (June), and Alvin (Buddy), sisters; Mary Jane and Troy (Hannum) Kaser, Phyllis Berryhill, Jeanette and David (Moran) Kaser, and Alice (Liebel) Kaser. She is survived by brothers, Daniel and (Mardell), Raymond, and sisters Mae and Lawrence (Hoernke), and Valerie and Richard (Feddick). Her children, Lois and (Claude) Boisson, Dennis and (Linda) Wilcott, Richard Wilcott, Diane and (Mike) Fehrenbach, Glenn and (Lisa) Wilcott. She also leaves her grandchildren, Kristin (Leanna) Wilcott, Kimberly Wilcott, Justin Wilcott, Colin Wilcott, Tad Fehrenbach, and Cal Fehrenbach and three great granddaughters, Madeline and Emily Wilcott and Freya Leanna. Our family is very grateful for the loving care given by the staff to our mother during her long stay at the Three Oaks Health Services in Marshfield WI. A Mass of Christian Burial will be held at 11:00 am on Friday, April 12, 2019 at St. Mary’s Catholic Church, Auburndale, where the visitation will be from 9:00 am on Friday until service time. Rev. Antony Arokiyam will officiate. Burial will be in the parish cemetery. Rembs Funeral Home is assisting the family. "Email Address" would like to share the life celebration of Marjorie A. Wilcott. Click on the "link" to go to share a favorite memory or leave a condolence message for the family.